This Yerba Buena standby strikes the right balance of class and comfort. The roof terrace is fit for a work lunch or a date night, serving seasonal cocktails like the Foxey Lady (Pimm’s No. 1, celery shrub, fresh lemon, and rose) and comfort food like mac and cheese and polenta fries. 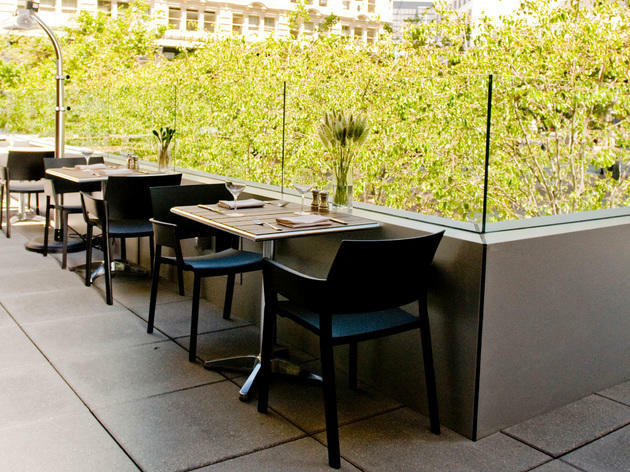 Located a stroll from the Jewish Museum and SFMOMA, it’s a popular warm-weather spot for a glass or two of wine—there are a dozen varieties on tap, available by the glass, 500 ml, or liter. But it’s an inviting bar even in cooler months, thanks to wind-blocking glass border and generous smattering of heat lamps.